Congratulations to Thirroul Thunderbirds Youth team and GPR Super Hoops for being crowned 2018 League Champions in their respective competitions. The Thunderbirds won the inaugural FSC Women's Youth League competition and will play the major semi-final on Friday night at Gibson Park. The Super Hoops are League Champions in the Community League Masters Division 3. A number of other Thirroul teams have qualified for the finals in their competitions, including Thunder First Grade, Reserve Grade and Youth Grade teams in the District League, along with Thunder DC team in the Community League Division 1 Reserve Grade. Thirroul JFC also has seven teams in the FSC Graded Junior semi-finals, commencing next weekend. Congratulations to the U12G.1, U13G.1, U15W.1 Blue, U16W.2, U12.3, U15.2 and U16.2 teams for qualifying for the finals. To all of the other teams and players whose season has been completed, thank you for being a part of our club this season. Thirroul JFC looks forward to seeing you at our upcoming 2018 Presentation Awards events. Also, keep and out for information about the club's Summer 7s Junior and Senior Summer 7s. Thirroul JFC is pleased to announce the re-appointment of Tina Siskoska as Thunderbirds Division 1 coach ahead of the commencement of Women’s pre-season training next week. Tina joined Thirroul JFC last year and took the Thunderbirds to within one win of the semi-finals in what was a difficult season, with 2 teams in Division 1. The club believes that under Tina's coaching the Thunderbirds will continue to develop and strengthen in 2018, while catering for players of all abilities and ambitions. A kick-around will be held next Wednesday, 10 January, at 6.30pm at Gibson Park for any players wanting to play for the Thunderbirds Women’s teams in the 2018 season. Regular training and team selection will begin the following Wednesday, 17 January. The appointment of coaches for other Thunderbirds teams will be made in coming weeks. Thirroul JFC is pleased to welcome Dictate Australia as a new sponsor to the club. Dictate Australia has taken up one of the club's Sponsor a Player packages and are sponsoring Thunder player Corey Haines-Grose for the 2017 season. Corey, who began playing for Thirroul at a young age, returned to the club after a stint with Bulli's successful Youth Grade team and is a key member of the Thunder first grade squad. He also coaches the Thunderbolts Under 13s Division One team along with Josh Williams and last year coached the Thunderbirds Division One women's team. Dictate Australia director Dave Holmes was keen to sponsor Corey after he scored match winning goals for the Thunder in recent games against Coniston and Kiama. Watch Corey's goals by clicking on the links above (in bold). Dictate Australia Pty Ltd provides digital voice solutions Australia wide. This includes digital voice recorders, dictaphones and transcription kits from Olympus Imaging Australia. We are a Gold Professional Olympus dealer. Dictate Australia own and use both Windows and Macs and test the products we sell on both platforms allowing us to give full cross platform support. Dictate Australia is also a leading reseller of voice recognition software for Intel Mac (Dragon Dictate 3.0) and Windows (Dragon NaturallySpeaking 12). We are a Gold Certified Dragon NaturallySpeaking reseller and we are also a beta tester for Dragon Dictate for Mac. Site licences for education, government and corporate are available for Dragon Mac & Windows as well as standard single install licences. Further details about Dictate Australia can be found by clicking on their logo, which is located on the home page of the thirroulfootball.com.au website. Please support Dictate and the community of sponsors who support Thirroul JFC. For information about sponsoring Thirroul JFC, including Sponsor a Player packages, please go to the Sponsorship tab at the top of the website. Thirroul JFC is pleased to welcome Bulli Medical Practice to the club as a new sponsor for the 2017 season. Bulli Medical Practice has taken up one of the club's new Sponsor a Player packages and will sponsor Thunderbirds player Alex Pritchard. Alex, who is a registered nurse at Bulli Medical Practice, is a great club person and role model. Besides playing for the Thunderbirds Division 3 team, she also coaches the Under 15s Girls team and was last year named the 2016 Thirroul JFC Senior Club Person of the Year. Another member of the Thunderbirds "Thirdbirds" team, Keely Mar, also works at Bulli Medical Practice, which has a proud history of supporting the local community and is a regular sponsor of Illawarra Folk Festival, Scarborough Board Riders and the PCYC. Further details about Bulli Medical Practice can be found by clicking on their logo, which is located on the home page of the Thirroul Football website. Please support Bulli Medical Practice and the family of sponsors who support Thirroul JFC. Thirroul JFC will celebrate Female Football Week by hosting the annual Thunderbirds Cup at Gibson Park on Sunday, March 12. The tournament, for Under 16-18s girls, will again feature some of the best female talent among those age groups in the South Coast region, including the Albion Park team which won last year's FNSW Under 18s Champion of Champions final. In total, eight teams from Albion Park, Bulli, Shellharbour, Thirroul and Warilla will contest the Thunderbirds Cup, now in its third season. The previous winners were Woonona in 2015 and Albion Park in 2016. Kicking off at 9am, the tournament will be played in a round-robin format, with each team guaranteed a minimum of two games. As part of the Female Football Week festivities there are a number of activations taking shape across Sydney focusing on the development of the female game from a player, official and referee perspective. 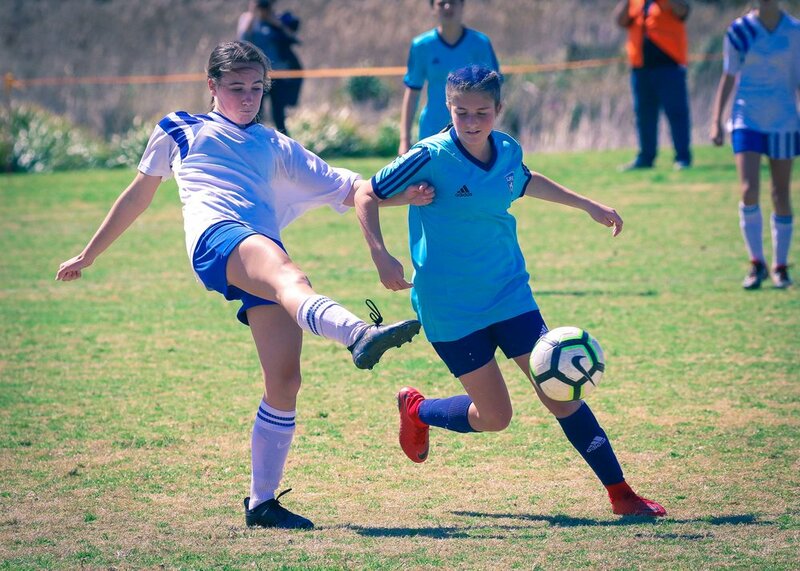 Football NSW Game Development Officer for Women and Girls Servet Uzunlar was eagerly anticipating the week and encouraged everyone to get behind what will be a fantastic week for the female game. “It’s great to see such an initiative dedicated to the Female game. “We have several key activations across various areas from around Sydney that will help support and show awareness of the female game. For those who have endured years of frustration and anxiety whenever it rained about cancelled games and training at Gibson Park these photos may seem hard to believe. The top photo and several others were taken today, Saturday March 4, after more than 120mm of rain. The other photos are from last year, after similar heavy rain. The difference is stunning and will be a game changer for Thirroul JFC this seasons and in the years ahead. The ground is closed for the weekend, along with all Wollongong City Council grounds, but during the season Thirroul teams will be able to play when they previously couldn't and training wouldn't be constantly disrupted every time it rains. We also expect the playing surface to be better for longer as it won't be effected by grass die off from flooding or teams being forced to train on degraded areas. To help preserve the surface, teams will be discouraged from training on ground 1 as much as possible as other areas should be in good condition. A big thank you to everyone who helped make this possible by supporting the club's fundraising through the annual Race Nights or by buying Junior Team Photos and playing senior Summer 7s on Sunday afternoons while the grounds were out of action due to the drainage works. Thirroul JFC would particularly like to thank the Member for Keira, Ryan Park MP, for $35,000 funding from the State Government 2015 Community Building Program and Wollongong City Council for a $30,000 grant to enable the club to do both grounds. It is estimated that the drainage improvements also cost Thirroul JFC a similar amount through the club's contribution to the costs and lost revenue from Summer 7s this year so please continue to support our fundraising events and through the sponsorship packages on the thirroulfootball.com.au website. Finally, Thirroul JFC would like to thank Turspec for doing such a fantastic job. Eastern side of Ground 1, near where the dug outs are usually situated. The same area last season.